Writer-director Peter Berg’s retelling of a tragically unsuccessful 2005 U.S. Navy SEALS mission in Afghanistan, Lone Survivor, is a bracingly visceral film that doesn’t let go of its audience for its entire two hours. Berg, a former actor, has assembled an interesting, varied filmography, from highs (Friday Night Lights) to lows (Battleship) to noble failures (The Kingdom). He really comes into his own with Lone Survivor, delivering a true story of survival that not only pays tribute to SEAL Team 10 but also works as a straight-ahead war movie. The idea here was to focus on the mechanics of the mission itself, the men who undertook it, and the aftermath. Don’t come to Lone Survivor looking for commentary about the U.S. war in Afghanistan or the any real historical context. 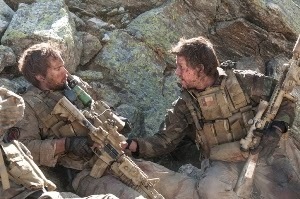 The target of Operation Red Wings was Taliban leader Ahmad Shah (portrayed by Yousuf Azami), but the operation goes horribly awry shortly after the team is discovered by a trio of goatherds (two are young boys). The team has set up on the outskirts of Shah’s base, but now they’re faced with a real conundrum. Do they kill the three Afghans (who may or may not be Taliban affiliates) in order to hopefully avoid detection, or follow the Rules of Engagement and set them free? For a combination of reasons, not the least of which being the young age of two of the goatherds but also the possible repercussions once the reports of their actions broke worldwide, team leader LT Michael Murphy (Taylor Kitsch) decides to let them go. 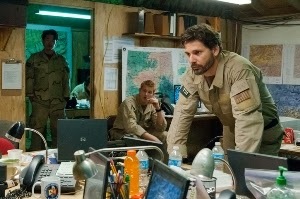 Murphy, along with MH1 Marcus Luttrell (Mark Wahlberg), GM2 Danny Dietz (Emile Hirsch), and ST2 Matthew Axelson (Ben Foster), head for higher ground in order to re-establish communications with LCDR Erik Kristensen (Eric Bana). But their connection is weak and soon enough the enemy has been notified about the team’s presence. Thus begins one of the most harrowing combat sequences committed to film. The title, of course, is about as big a “spoiler” as can be imagined. The film opens with the end of the story, showing a badly injured Luttrell flatlining while under U.S. military care. Whether or not you already know the true story (Berg adapted the screenplay from Luttrell’s memoir of the same name), Lone Survivor remains spellbinding. Berg isn’t trying to deliver a history lesson here so much as simply convey the story of these men. He succeeds with a technically staggering depiction, aided immensely by cinematographer Tobias Schliessler and editor Colby Parker Jr. 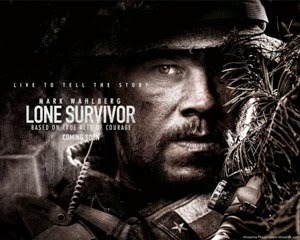 The cast deserves kudos as well, with Wahlberg in particular delivering his best performance in years. Photos of the real SEALs involved in the operation provide an especially moving conclusion to a powerful film.